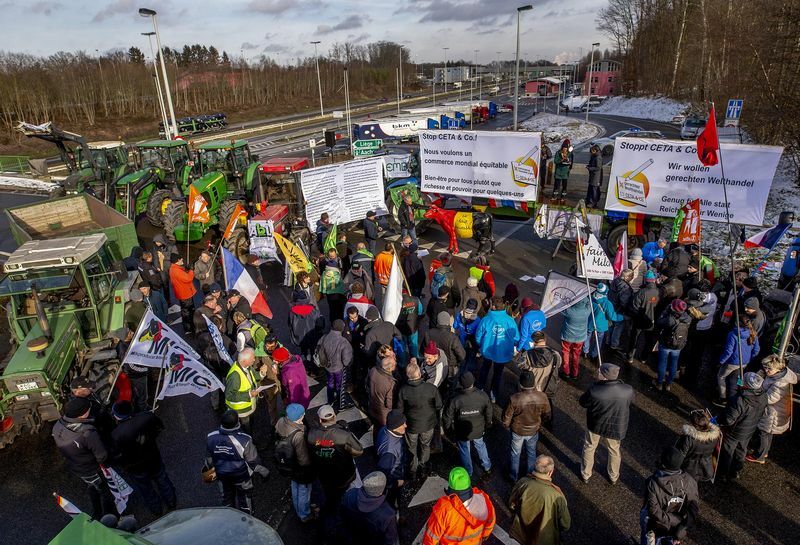 Lichtenbusch (Belgium), 25 January 2019 – A dozen meters from the Belgian-German border, overlooking from a bridge, representatives from 17 farmer organizations from 7 European countries gathered here today to denounce the EU’s current trade agenda*. “Today when, in the EU, we are discussing the future agricultural policy from 2021, and the legitimacy of the reform is based on making agriculture more dependent on environmental issues, we find, at the same time, that the EU is increasing the free trade negotiations that destroy the most sustainable model of agriculture, more linked to the environment which is that of small and medium-sized farms and estates.” Said Andoni Garcia, ECVC committee member. After a series of interventions, participants from Germany, Belgium, France, Luxembourg and the Netherlands, “flattened” CETA and other free trade deals, in a symbolic action where the FTAs thrown on the ground and stomped on. Afterwards, the various farmer representatives went on to sign a European farmers’ declaration, which demanded a fair EU trade policy that ensures fair producer prices, fair working conditions, environmental protection and animal welfare, high quality food and food sovereignty. Besides the CETA, there are also serious concerns by farmer and other civil society organizations in regards to the Mercosur-EU FTA, the EU-Japan FTA (scheduled to come into force at the beginning of February), and a series of other trade deals currently negotiated by the EU with several countries and regions of this world. For European small farmers, FTAs like CETA and mechanisms like the ISDS are instruments that destroy Food Sovereignty, the capacity of governments to legislate in favour of the model of peasant, family and sustainable agriculture, for the protection of the environment and the rights of people. ECVC, together with AbL and FUGEA demands : RIGHTS for PEOPLE and PEASANTS, OBLIGATIONS FOR MULTINATIONALS. LET US STOP CORPORATE IMPUNITY**. * This demonstration takes place ahead of the judgement expected on 29 January by the European Court of Justice (ECJ) on the compatibility with EU law of the ISDS mechanisms within CETA. Summoning the ECJ was the conditionality put forth in September 2017, by the Belgian government as part of a deal struck between the Belgian Federal government and its regional parliament of Wallonia, after the latter had threatened to block CETA. ** The European Coordination Via Campesina invites other organizations and individuals to support the campaign against ISDS and sign the petition.